The 1947 Mercury station wagon parked in the lot across from my house. When I retired from teaching I decided to get myself a retirement gift. (I didn’t really fully retire .. I worked two other jobs during the next 11 years). I always had my heart set on owning an antique car. I fulfilled this dream once many years ago. Maybe I should start the story there. As an oil burner serviceman my dad spent a lot of time on the road attending to customers who needed repairs to their boilers. He even took me with him a couple of times – I still remember one cold winter night in the early ’60’s when he got a call around 12:00 pm and he asked if I wanted to go ‘on the call’ with him. You bet I did! It was snowing when we pulled into a Franklin, Massachusetts factory that needed its boilers repaired immediately. In those days the vans issued by my dad’s company had just one front seat. I would just find something to sit on; it was a Ford Econoline van and so the engine cover served the purpose. Many years later, around 1973 or so, my dad came home from another service call with some interesting news. On this one trip dad had been through a small town in eastern Connecticut (Griswold?). He had seen an old wooden station wagon sitting on a front lawn. It had gray-green fenders and hood, orange and yellow doors, and a black fabric top. It also displayed a sign that read “For Sale / $300.00”. I had been wanting to purchase an old car for years and my father was aware of that. He also liked old cars and did not discourage me in my search. This news was just what I needed. We went to check out the Woodie later that week and I ended up closing the deal. I drove it home while dad and the seller followed in their cars to insure that the wagon and I survived the trip. About 5 miles from home the 1947 Mercury station wagon finally broke down. The flathead V-8 engine was overheating and emitting steam. The seller knew what was wrong. He added a few squirts of oil to the bearing cup around the fan and it once again moved freely and cooled the contents of the radiator. Who would have guessed? 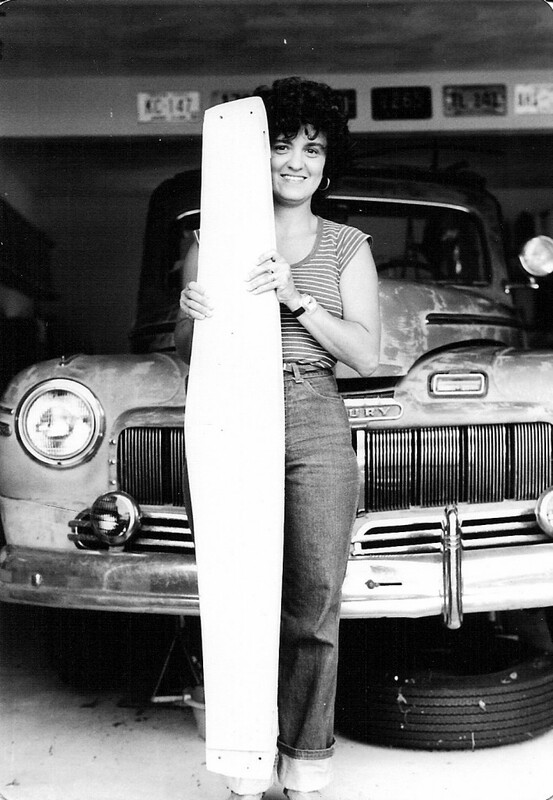 My wife holds the complex wooden header that was manufactured by a Cincinnati cabinet maker. The old piece was rotted. Note the wagon in the background. Note my wife in the foreground. 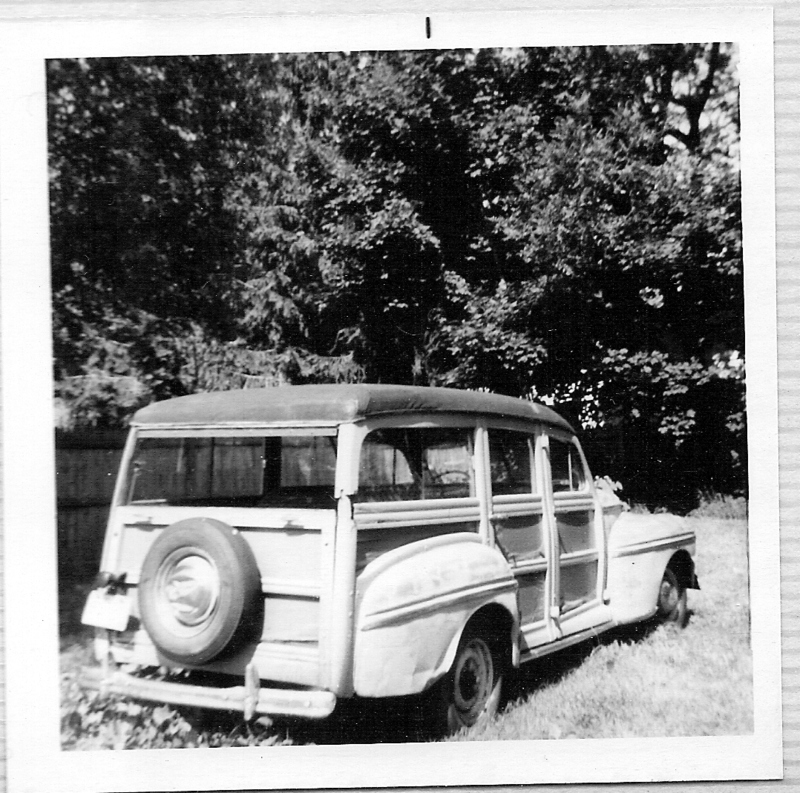 The Mercury wagon had an all maple body frame, mahogany door panels, and leather interior. It was missing only the third seat, air cleaner, and the cover to the spare tire. I rented a garage from a friend so as to keep it out of the weather. My restoration over the years consisted of little more than accumulating new parts (including having many replacement wood pieces made). I installed almost nothing. The car followed me to my new home when I was married in 1976. Eventually I sold it, many years later, to a collector from New York. We needed money to replace my wife’s car that was stolen and so the Merc had to go. Oh well. It was fun while it lasted. Today I could never afford to buy a Woodie in any condition. The prices are astronomical. I made the trip to Cromwell, CT to check the car out. The description was pretty accurate. The car was under a cover in the yard while the garage housed a 1930’s Packard. It seems the seller had one car too many. The original ad from Auto Trader, August, 2002 issue. Note the “$5,700 OBO” price. Unfortunately when the seller drove the car for our road test he had a lot of trouble putting it in first without shaking everything up. I suspected some sort of major clutch trouble so I declined the purchase. A week later I got a call from the owner. He wanted me to look at the car again at a new price of only $4,500. This time I went with my wife and I drove the Buick during the test drive. I was able to easily shift in first by just giving it a bit more gas. The deal was sealed when my wife who rode in the back seat said the ride was smooth enough for her. I put down a deposit and a week later my dad went with me to pick the car up. My next “Buick” installment of this blog will provide updates on the minor work that has been done on the Roadmaster in the last few years. I also hope to include a short video and some detailed photographs. 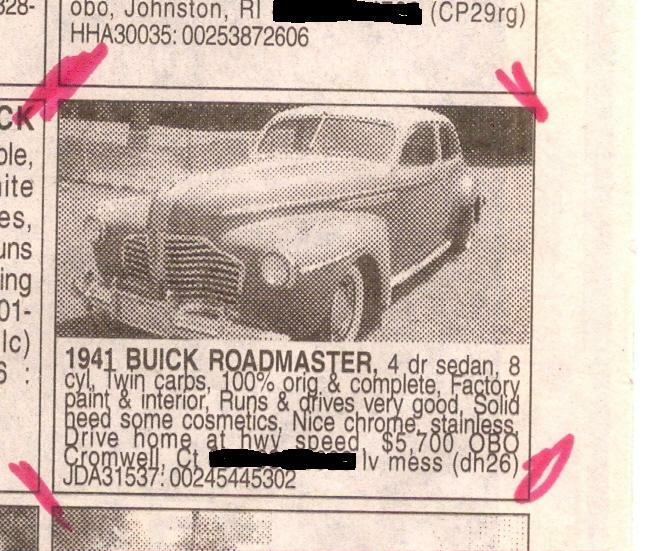 I encourage anyone who requires information about an authentic 1941 Buick Roadmaster Sedan, Model 71, to contact me. I am always happy to help out. Restoration Facts, 1941 Buick, by William C. Anderson. This is the definitive volume for the 1941 Buicks. Purchase it direct from Mr. Anderson and request an autograph (I did!). Note: Comments welcome. Please use the social media buttons below to make others aware of this site. Thanks! This entry was posted in 1941 Buick Roadmaster, Occasional Commentary and tagged 1941, 1947, 71, antique, Buick, eight, ford, Mercury, Roadmaster, station, straight, wagon, woodie. Bookmark the permalink.